A couple years ago I gave a talk called “Parenting for Academic Success” that I gave for Diablo Valley College’s New Horizons Program. It was the beginning of the school year (just as it is now), and these 50 parents were HUNGRY for help on how to support their 8th graders as they move through high school and into college. Given that we’re at the start of another school year, it’s worth reviewing the main point that got the most nods and “mmmmmhmmmmmms” from these eager parents. Each of us learns in a unique way. We have preferences for how we like to learn, and which learning styles are most/least effective for us. Often, parents’ learning styles are different than their child’s, a discrepancy which often causes arguments between parents and children about how to study. Take, for example, an experience from my own teen years about doing math homework with my dad (who is a mathematician). I always wanted to know how to do a problem; dad always wanted to tell me why the math works the way it does. This drove me crazy!! Clearly, my father and I had a different way of learning and loving math. I wanted step by step instructions; he wanted the big picture theory. (Side note: While I was telling this story at my talk, a dad in the front row burst out laughing; evidently he and his daughter have exactly the same problem!). Take a learning style assessment all together. There are tons available online. Share the results with each other. 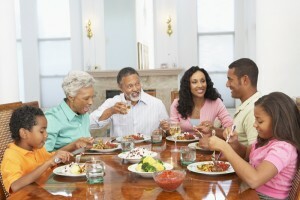 Know who in your family is more visual, more kinesthetic, more verbal, and so on. Build learning styles language into family conversations. For example, at dinner talk about your day from the reference point of learning styles. Perhaps tell a story about how your boss expected you to do a project in a way that felt unnatural to you. Discuss how you advocated to get the same project done, but in a way that suited your learning style better. Ask kids questions about how they learned what they learned in school that day, and note the successes that come with kids are learning in ways that are natural to them. As parents, practice some learning styles that are outside your comfort zone, and encourage your kids to do the same. After all, just because we have preferences for how we learn doesn’t mean we can’t grow in other areas. And the more you’re willing to model hard work and growth, the more your student will be comfortable learning in ways that don’t always suit their preferences. Once students know their learning style and understand the importance of studying according to that style, they will have an easier time getting help from their teachers and their parents. They can more easily name their learning challenge and ask their teachers and parents for exactly what they need. If you know your child is having a hard time, suggest they go talk to the teacher — but FIRST make sure they are equipped with the right language that will get them what they need. Spend some time at diner role-playing the requests they might make of their teacher the next day. Make it easy and quick, but do make sure your teen practices saying things outloud. Learning styles aren’t just visible at school or at work; they are all around us! Incorporating more discussion about learning styles into your family discussions will pay off over the long run, as kids become more and more comfortable talking about, trouble shooting, and advocating for their learning styles. How do you prefer to learn? Has your method of learning every clashed with someone else’s? Let me know in the comments! P.S. Was this post helpful? Get more great tips and helpful ideas by signing up for free email updates!